17-year-old Jen turns her life upside down when, out of boredom, she makes a bet that she can turn school geek Trevor into someone like her. Instead, the goth girl finds herself sucked into his world of sci-fi movies, charity work, and even-ugh!-bowling. To truly belong with him-and with her new foster family-she must first come to terms with her violent past. Yes this book is predictible but I really didn't care! This book is so totally and utterly un-put-down-able! Jen is the perfect narrator, witty, charming and she keeps you intrested. And Trevor seems to be her perfect match. I've read some books that were written extremely well but the the chemistry of the couple(s) wasn't there, but Bennett has been able to make Trevor and Jen such a realistic and convincing couple that I had to fight the urge to go "awwww" when I was reading their moments together while I was in the bus or near people who would stare at me in confusion if I did. So yes I knew from the start that Jen and Trevor would end up as a couple and that Trevor would be annoyed when he found out that he had been a "bet", but that wasn't important. This book is unexpected in many other ways, yes its filled with humour but it's also filled with so many other emotions that have the potential to make you cry as well as laugh! You might be laughing through your tears, or just plain sobbing. But one thing this book is not, is plain. 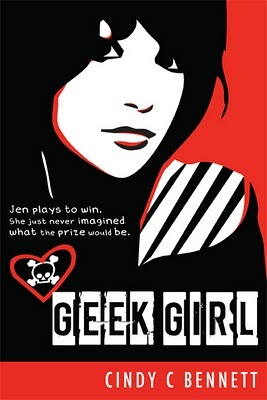 I love this book, a refreshing read that focuses on the cute but complicated teenage love life.